If that's all it is, wouldn't it be enough to simply note this oddity in the CAR and move on rather than to try to make sweeping philosophical judgements about what constitutes open and closed junctions and the like? Yes, one concern is adequately explaining CC1, and another is eliminating the contradictions in the CAR. But another non-trivial issue is whether the HiG team is aware of the consequences of the ruling. Maybe they are, maybe they aren't; I'm still looking forward to hearing what Kettlefish has to say. In my experience, rules questions often get answered in kind of a bubble that looks for a quick precedent to follow, even if that precedent isn't the right guidepost. Also in my experience, good game companies are willing to rethink problematic rulings, when presented with solid reasons to take a second look at the situation. So look, I get it, not everyone has the patience for this kind of analysis, and not everyone finds it worthwhile. That's cool; they don't have to. But that doesn't mean there isn't value in going through the process. Those who think it's a waste of time are not required to participate. But there's no harm in letting those who do find value in the discussion work through the pros and cons. Whatever comes out of that will still need to meet with the general approval of the community. And it's possible that the result of all this won't even be all that different from what's in the CAR now; possibly very similar to what you yourself suggested a few posts back. But at the same time, I would like to see what the other options and opinions are. People reading the CAR will see a tile and say: what are the rules about this tile? They will not need some sort of rule that works for them some of the time and a list of exceptions to this rule with some other unrelated tiles in their current predicament. I am happier than ever that I switched to the new art and that CC1 evaded me. Roundabout and labyrinth tiles are still relevant to me and they so obviously join roads that absolutely no comment is required in CAR. The CC1 tile rule is not logical to me but it is applied in JCZ to the stipulation of the comment in CAR so we have a tournament rule. If I had the CC1 tile and played with friends it would be a 3 way single road and no one would consider any different, the art work is clear. But if I play with anyone from Carc Central it will have to be a junction. CAR must list the official rules, tile by tile where necessary. The house rule comment is sufficient for tile anomalies actual or perceived. I know it is CCI really by the way sorry if using a 1 irritated anyone. Sorry Richard, but you appear to be under the misapprehension that 'Old Git Status' is given away lightly. It is not, and is only afforded to that select band who have reached the big 6-0!! You will have to wait your turn, just like I did!! On another note, I recall kettlefish told us that they look at the tiles for the German Cathedrals and remarked that some bushes were needed to prevent a single road lopping round a lot of the cathedrals. 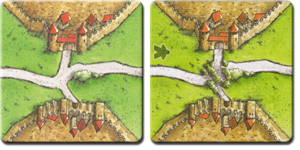 If you're able to find the sneak-peak version of the tiles you may be able to see how the change was applied. It's good to see the publisher made clear what constitutes a junction on later tiles. Didn't want to leave my original comment open, so grabbed a screenshot from the original news post which shows 'Frauenkirche Munich'. I've also attached a screenshot from Cundco. You'll notice they've added a bush to make sure the two roads are not merged or confused. Just in case anyone was interested. Thanks for the screen shots, Decar. It is a weird situation. They really shouldn't have to add the bush, since the ruling would seem to make it unnecessary; yet they do anyway. Same story with the T&B tile they revised (below). It feels like they recognize that the ruling is really counterintuitive, so they make artwork changes to keep the ruling from coming into play. Anyway, don't worry, folks. I've listened to the feedback here and I'll leave the CC1 tile issue safely at "status quo" for the next CAR. My thanks to everyone who took the time to think about this and post your thoughts. we put some separate pages into the CAR like the part with the table or the part with the game play with the minis robbers and depatches. If you like, than you can create one new page about the differences with the junctions, crossings and the roundabouts. At CarcF we have a complete tile list in the download section. I personelly prefer the tile name of these lists - HiG uses also the names of the tiles. I will stick this topic too, that we have all the discusion on top as long as we are working for our CAR 7.5.